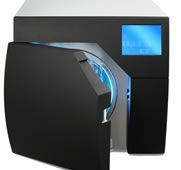 SST2200B and SST1700B a new complete line of small steam sterilizers . C.B.M. has merged its own experience in steam sterilization and its stainless steel manufacturing know-how, into a new line of bench top autoclaves conforming to EN13060. SST2200B and SST1700B have a smooth, clean and minimal design with the latest microprocessor technology. SST2200B and SST1700B have been designed for easiness, reliability and durability.